Swamp Thing #35 - Written by Charles Soule, illustrated by Jesus Saiz, colored by Matt Hollingsworth, lettered by Travis Lanham, published by DC Comics. 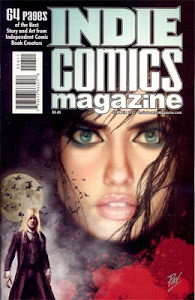 Remember what happened last month in Swamp Thing, denizens? Yup, it was that “Futures End” event thingy, that was actually 85–92.3% enjoyable — the remainder was diminished by outside unneccesary superheroicular (my word, I own it) interference, but whatchagonnado. That said, do you remember what happened the month prior to the interrupting event of our regularly scheduled programming? No, seriously, do you remember? You see, I didn’t. Thankfully, Soule and Saiz bring us back to the story they were attempting to tell with the fourth page of this issue. First we learned of the Green. Then of the Red and the Rot. Not long ago we became aware of the Grey, and now the Machine makes its presence known. The Machine sends a servent, or a Calculus as is calls itself, to approach the Swamp Thing with an appealing offer. Brother Jonah provides some unexpected advice on how to best handle this offer. Above I mentioned the fourth page bringing us back to the regular story, and the creators do this through fantastic dialogue (the Swamp Thing and the Calculus) and clever hints / reminders in the artwork (the smoldering, fetid corpse of what was once the Wolf). The Calculus — who I mistakenly thought had something to do with the “Futures End” thing — is an awesome new character brought to life through its quirky manner of speaking that humorously, yet effectively, uses combinations of social networking lingo, poorly translated lines a la “All Your Base Are Belong to Us,” and the myriad of news headlines and commercials we are bombarded with on a regular basis. The character design of the Calculus is equally cool, as “he” is a featureless, silver-skinned being dressed impeccably in a pinstriped suit that is rendered with unbending, perfectly vertical stripes, almost as if his perfectly-tailored suit is itself a monitor. The only way Hollingsworth depicts creases or folds in the Calculus’s suit is through a darkening (or possibly a lowering of opacity) of various areas of the striping. You really just need to check out the page; it’s rather cool. Also worth noting are the first three pages of the book, which although having little of Saiz’s gorgeous artwork, is still fascinating in that we briefly learn the moment of the Machine’s awakening to its own kingdom. To do this Saiz uses only straight lines to simulate a network, which Hollingsworth brings to life with vibrant glows as Soule carries the weight of the storytelling through his captions. Despite being primarily text and straight lines on a double-page spread, Saiz provides a bit of overlay of the expanding Machine overtop of the Red, Grey, Rot, and Green, making these first three pages an incredibly effective introduction to the new kingdom. So, that’s what I thought about the first four pages, and of course you have all the fantastic writing, and gorgeous illustrations you’ve come to expect from this title. In addition you get some great moments seeing Alec’s true dream, some time with Brother Jonah, and one heck of a double-page spread of a prehistoric meeting between the Red and the Green that is certain to knock any Swamp Thing fan senseless. All this without a single punch being thrown…that looks to be next issue. 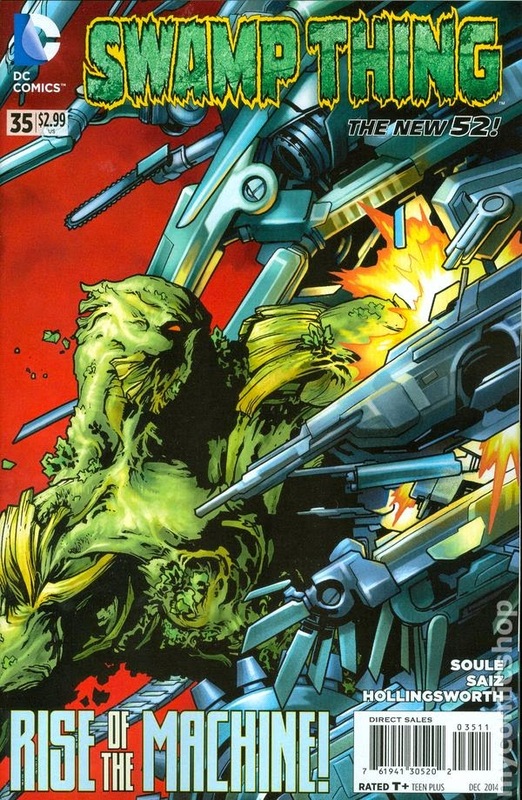 Now that Soule has gone exclusive with Marvel, his time with Swamp Thing is now limited, which is a bummer. 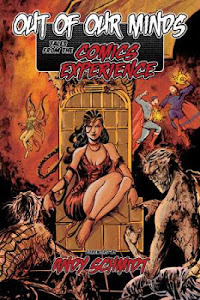 He brought a degree of humor to this book that was not normally found in the treasured Alan Moore run, yet Soule managed to make it work while retaining the horror element I so love with this character. I am excited to see what he gives us before he moves on. HIGHLY RECOMMENDED! 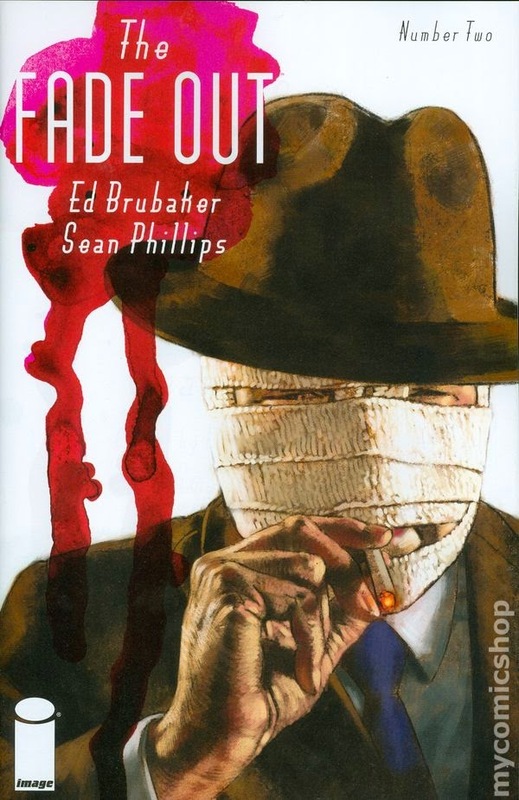 The Fade Out #2 - Written by Ed Brubaker, illustrated by Sean Phillips, colored by Elizabeth Breitweiser, edited by David Brothers, published by Image Comics. Funerals. They’re where the observant can notice things about their fellow attendees. For instance, Charlie knows the dead starlet did not commit suicide, she was murdered, possibly by someone in attendance. Why, oh why, did he confess he was the one who found Valeria’s murdered body, to Gil Mason, of all people? It might have something to do with Charlie and Gil’s unique working relationship. Not much happens in the case of who murdered up-and-coming starlet Valeria Sommers…but that’s okay, we’re still learning about the players and the world of this story. This is especially true on the clever, complex relationship Brubaker and Phillips have developed between Charlie and Gil, which is something I did not see coming, yet adds a pleasant twist to the story. As with all stories by this creative team, so very much is tucked away in the details of a page…on an individual panel even. In this issue we see more of the friendship between Charlie and Val as they discuss her lines on a script. The body language of the scene shows Val snuggling up close, reclining on him, sharing a cigarette, and then giving him a compliment, to which he says nothing; the scene ends with Val’s smile and her knowing eyes. What she knows, or whether or not she is somehow manipulating Charlie is not yet clear, but there is more between them than we yet know. Although this issue is primarily people conversing in relevant settings, there a couple pages of action at the graveyard, where Phillips beautifully choreographs an argument that comes to blows. It’s a well-crafted scene, as the “camera” rotates slowly clockwise around the players, and Breitweiser’s cool color scheme heats up to four panels of intense reds; it’s dang impressive. What’s equally impressive, or rather shocking, is the backup story by Jess Nevins that briefly details the injustice of the scandal to which Rosco “Fatty” Arbuckle (1887–1933) found himself mired in. I had never heard of this travesty of justice before and the situation is so unreal that it is hard to believe it actually happened. Definitely worth taking the time to read, and I now must see if I can dig up a documentary or some such about this Fatty Arbuckle tragedy. 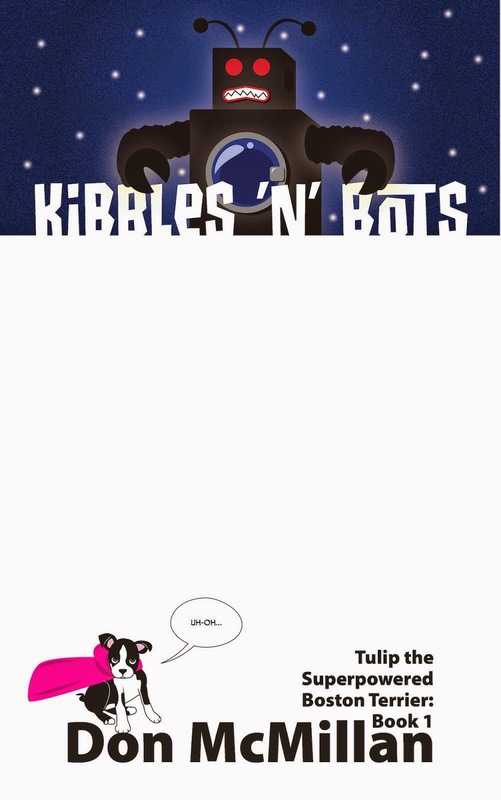 As for the comic itself, we are only two issues in thus far, and I can tell you with certainty that I am staying around to see how things play out. A great new crime period piece. HIGHLY RECOMMENDED! Avengers Versus Thanos TPB - Written by Jim Starlin, Mike Friedrich, Steve Gerber, Steve Engelhart & Scott Edelman, illustrated by Jim Starlin, Don Heck, Bob Brown, John Buscema & Mike Zeck, inked and colored and lettered by so many people I just can’t list them all here, published by Marvel Comics. Now, if you’ve been following Donist World for any length of time — like, say, over four and a half years — then you know I have a love…a thang…a soft spot in my cold, dark Donist heart for the Jim Starlin Warlock and Thanos stories (you can read my thoughts about it here, here, and most substantially here). So…done reading those ancient posts from a Donist World past? Good, let’s do this thing. My feelings have not changed one bit since the days I first read the six-issue Warlock Special Edition reprints that blew my 12-year-old mind away. Since then, I have reread those stories on a fairly consistent annual basis and my love and appreciation has only increased over those three (oh, denizens, has it been that long?!) decades. One thing, however, that drove me absolutely nuts about the Warlock re-issues was that they oftentimes referenced the Iron-Man, Avengers, and Captain Marvel issues that covered their encounters with Thanos who had then held the Cosmic Cube. Not only that, it showed the green-skinned, purple-clad Drax the Destroyer, who I would only see a year later in 1983 in the pages of the Marvel lovers’ sacred text known as The Official Handbook of the Marvel Universe (aka OHOTMU, for those of you playing the home game, and which I am now on a quest to reacquire). Characters I loved, cool new characters I knew nothing about, something called a Cosmic Cube, Thanos as a disembodied, all-powerful head floating in outer space… How could you not love that?! Anyhow, buying and reading those missing individual issues back then were beyond my financial capabilities (I did have The Micronauts commanding my allowance money, after all). Until now. The Avengers Versus Thanos TPB is a beast of a book at 472 pages of mostly comic book story that is approximately 2/3 of material I had not read (Thanos first arriving on the scene, Drax the Destroyer, Captain Marvel cosmic awesomeness, and the Cosmic Cube), with the remaining 1/3 belonging to my treasured Warlock stories. The volume of individual comics contained in this collection is simply daunting and further reason to pick up this trade as opposed to hunting down all of the pricey individual issues. You get issues of The Invincible Iron Man, Captain Marvel, Marvel Feature, The Avengers, Daredevil, Warlock, Marvel Two-In-One, and the Logan’s Run Thanos material as well. All you need is this hefty book to get in on the key Captain Marvel and Warlock issues and see where Thanos got his start. After all of the rambling above, the question looms: did I like this addition of Thanos and the Cosmic Cube, or was the hope of this story better than the actual thing? Oh, denizens, it was so much the former; I LOVE this book. If you are a fan of Starlin’s (how could you not be) brilliant space opera storytelling (both written and drawn), his gorgeous character designs, and his awe-inspiring cosmic layouts, then you simply must own this book. I did prefer some issues in the collection to others — all of Starlin’s are of course my favorites — and as fantastic as the Cosmic Cube stories are, the Warlock ones still reign supreme for me, but I will say Thanos’s quest for power and his early confrontations with Drax and Captain Marvel have earned their place on my annual reread of this monumental Marvel work. I breezed through this volume over the course of a week, and then hammered through all of the recent Infinity TPB, which I hope to talk about next week — SPOILER ALERT: buy it as well. Now with two monstrous cosmic / Thanos books down, I’m off to read The Thanos Imperative, The Infinity Gauntlet, and it looks like it’s high time I finally read that Avengers The Korvac Saga storyline I’ve wanted to read for the majority of my life. 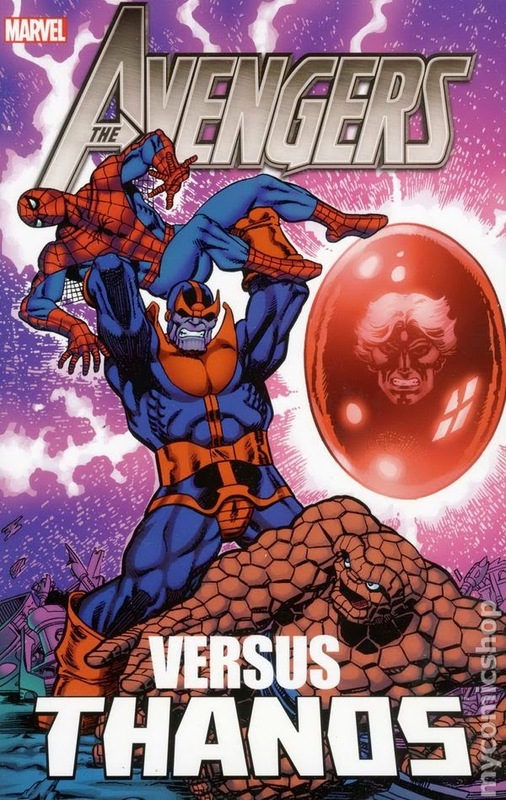 As for The Avengers Versus Thanos, you simply must read this tremendous book. VERY HIGHLY RECOMMENDED! Riverside Unified School District Bans The Fault In Our Stars From Its Junior High Libraries - First things first. I have not YET read The Fault In Our Stars, and I kind of wonder if the psycho parent at the center of this whole book banning by the Riverside USD has either. Oftentimes, those who seek to decide what actual freedom-loving individuals can and cannot read have not read the very books they are so deeply “offended” by. It’s kind of frightening that one overly-vocal minority can decide what I can/cannot read, what you can/cannot read, what your child can/cannot read, or what that random person across the street can/cannot read. What’s even more frightening is that the Riverside USD lacked the fortitude to tell this parent that if they do not want their child to read an immensely popular and beloved book (and now a major motion picture, btw), then that parent should exercise their right as a parent and not allow their child to read said book. Riverside USD should have said the parent has ZERO grounds to inflict their short-sighted will on other peoples’ children. Whatever Riverside USD’s rationale for stomping on the rights of their students and that of the parents who are fine with their kids reading The Fault In Our Stars — or any other book by Nerdfighter John Green for that matter — they failed the majority of those they serve; I guess any student suffering from a terminal illness, or feeling alone and desperate, or wanting to read the book their friends talk so much about will have to just buy the book themselves because the library, a place created for the collection and dispersion of the written word to everyone, has been censored by one overly vocal minority. Although I can understand every school’s fear of a lawsuit, Riverside Unified School District has a commitment to their students and to the community to make books such as The Fault In Our Stars available to their students, as most schools around the country already do. Parents should only be allowed to control what their child reads, not what other people’s children read. So, stand up to this one censoring jerk’s efforts to squash freedom in Riverside, and read the book, buy the book for a friend, see the movie, visit the Nerdfighters page, check out brothers John Green and Hank Green’s amazing Vlogbrothers YouTube channel, or the highly-informative Mental Floss YouTube Channel (where I find helpful tidbits like this), and if you are a parent in Riverside, contact the district office and voice your displeasure over one parent’s successful censorship crusade…I’m sure there are far more you (rational), then there are of them (positively nuts).